In a previous article, I pointed out that mock drafts are not a good way of predicting individual picks. This is still very much true, especially this early. But what they do provide is greater insight on each prospect, good background information and give readers a feel for the range a prospect might be selected. 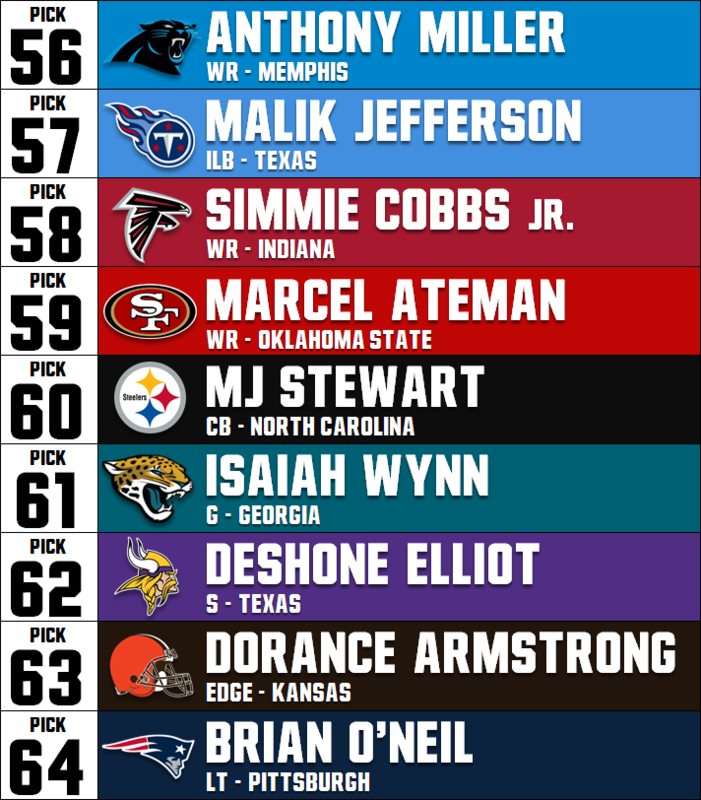 With that in mind, I made a two-round mock draft to give you an idea of who might be available when the Bears are on the clock. The Browns need to draft a quarterback and they go with Darnold from USC here. He is not as talented as Josh Rosen, but teams will be enamored with his personality. There is also the issue of Rosen hinting at the fact he won’t play for the Browns. The Browns would be wise to sign a free-agent quarterback so Darnold can sit his rookie year. Hey, Mike Glennon should be available for them if they want to go down that road for some reason. This would be a dream scenario for the Giants and Rosen. The Giants get the best quarterback in the draft and Rosen gets to go to a place that isn’t Cleveland. Rosen is a smart kid and should be able to handle the pressures of New York. He doesn’t have the same athleticism as other prospects but is the best pure passer. He is more suited to play right away than Darnold, but the Giants could still sit him behind Eli Manning for a year. The Colts need to upgrade their pass rush. Chubb is the best edge player in the draft and arguably best defensive player. He has great size and uses his hands and length well. He could still use some coaching to develop a counter move, but should be a double-digit sack guy once he reaches his potential. I thought about Saquon Barkley here, but the Browns should be able to get a good running back in the second round. Instead, they get a game-changing safety to bolster their secondary. Fitzpatrick is very much like Jamal Adams, who the Bears were connected to last year. He instantly changes the tone of Cleveland’s defense. Paxton Lynch has been a bust. The Broncos will be coaching Allen and Baker Mayfield in the Senior Bowl and likely draft one of those two players. Here they go with the higher upside with Allen. He struggles with accuracy and decision making but has a strong arm and good athleticism. He might have the highest upside of the quarterbacks, but he also has the highest bust potential. For this mock, I am assuming the Jets sign Kirk Cousins. Nelson is a prospect who can step in day one and immediately transform an offense. Nelson is the best prospect in this year’s draft and the best guard prospect in a decade. He is as close to a perfect prospect you can get. If he falls to the Bears they should be all over him. For anyone saying you shouldn’t draft a running back in the top 10, ask the Jaguars if they regret taking Leonard Fournette high last season. Barkley is a better prospect than Fournette and could have the same effect on the Buccaneers offense. 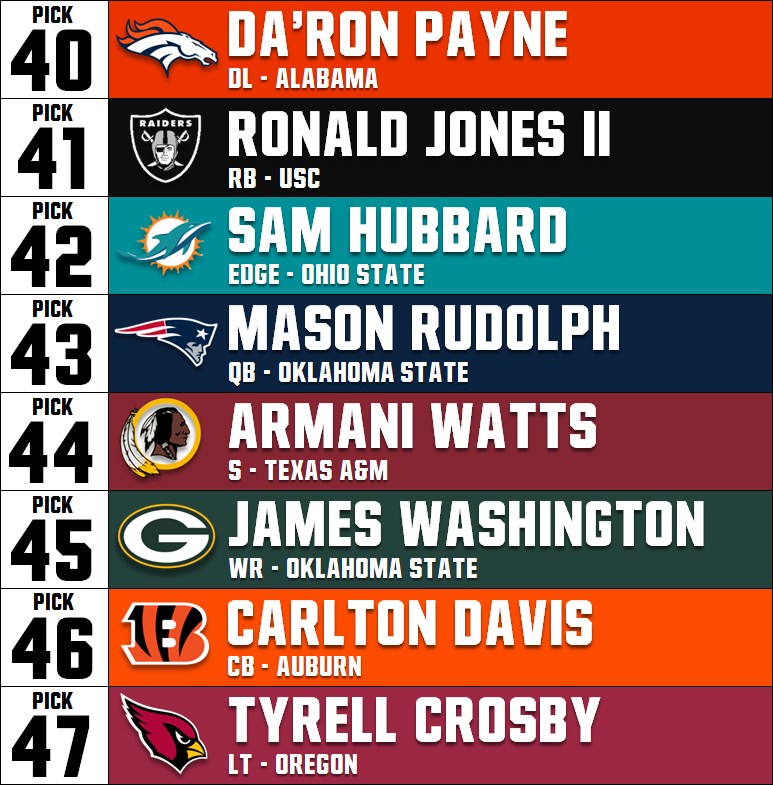 This pick might come as a surprise to some, but I expect Edmunds to rise up draft boards as the draft approaches. And with Chubb, Nelson, and Fitzpatrick all gone, Edmunds is easily the best player available. He also fits the profile of past first-round picks of Ryan Pace. For the most part, Edmunds played as an off-ball linebacker but did rush the passer at times. At 6-foot-five, 250-pounds with rare athleticism, Vic Fangio can use him in a lot of different ways in his defense. But he’s not a jack of all trades, master of none; he can legitimately be above average in any role asked of him. Whether it is a run stuffer, pass rusher, or in coverage he has the skill set to dominate. As an off-ball linebacker, he has the athleticism to play sideline to sideline. His elite lateral agility and ability to fight through traffic to make plays in the backfield sets him apart from others in this class. His athleticism and quick instincts allow him to easily avoid offensive lineman and disrupt plays in the backfield. He is quick to diagnose plays and is rarely caught out of position. In coverage, he can run step for step with most running backs and has the size and speed to shut down tight ends as well. He even matched up on slot receivers at times for the Hokies and more than held his own. Edmunds has the athleticism and traits to rush the passer as well. While he still has room to grow, he showed the necessary quick first step and bend to be effective. If used exclusively as a pass rusher, he has the potential to get double-digit sacks a year. Despite showing elite traits and some upside, he is still raw as a pass rusher. He is mostly projection in this area at this point and just needs some more reps to improve. In this sense, he is similar to where Leonard Floyd was when he was drafted. Pace should see the same upside in Edmunds he did in Floyd two seasons ago. Edmunds is the youngest player in this draft at 20 years old. Right away, he can play inside on running downs and off the edge on passing downs or blitzing up the middle. He would be a perfect compliment to Floyd and give the Bears two premium players to build the defense around. He might just have the highest upside in this draft class. This pick would also have a profound effect on Leonard Floyd. Last year Fangio dropped Floyd into coverage often. Drafting Edmunds allows Floyd to be a pure pass rusher which better suits his style of play. Let him drop into coverage where he is more instinctual than Floyd and the pass rush instantly improves. That’s without even taking into account what Edmunds can provide rushing the passer. Players with Edmunds’ combination of size, athleticism, and instincts are few and far between. A good combine could catapult him over Chubb as the best defensive player in this class. Other players considered: LT Conor Williams, CB Denzel Ward, EDGE Harold Landry, WR Calvin Ridley, WR Auden Tate. The 49ers grab the best cornerback in the draft here. Although slightly undersized, Ward’s ability to mirror wide receivers combined with elite athleticism makes him a top-10 talent. He might have better technique than ex-teammate and last year’s first-round pick Marshon Lattimore. The only thing stopping him from the top five is his size. The Raiders desperately need linebacker help and they grab arguably the top pure ILB in the draft. The undersized but super athletic Smith is a game changer for their defense. He is the definition of a sideline to sideline defender and will instantly upgrade the Raiders run defense. He is also quick enough to match up with running backs and tight ends in the passing game. No matter who plays quarterback next season for Miami, they need to solidify the offensive line. Williams could have been a top-five pick this year if it weren’t for one bad game and a minor knee injury. His 2016 tape shows a tackle with All-Pro potential. It would not surprise me if he went higher than this, potentially even to the Bears. The Bengals let Andrew Whitworth leave in free agency last season and that proved to be a mistake. Brown is a mountain of a man (6-foot-eight, 345-pounds) who moves well for his size. He needs some refinement but has the potential to be a starting caliber left tackle for many years. Worse case scenario, he can be an above average guard. Washington shocked the world by trading for Alex Smith, and then shocked it again by giving him a boatload of money. He’ll need some help at multiple positions in order to make that contract worth it. Here they get the best receiver in the draft. Ridley’s combination of speed and route running ability should allow him to have an immediate impact. The Packers need a pass rusher opposite Nick Perry. Clay Matthews is a shell of his former self and could be cut to save cap space. Landry can bend around tackles better than even Chubb and Marcus Davenport. He couples that with a variety of pass rush and counter moves. He had a great 2016 but struggled through nagging injuries this season. If he performs well at the combine, and shows he’s completely healthy, he should shoot up draft boards and potentially be in play for the Bears. If the Bears trade back, it will most likely be with the Cardinals. Even before Carson Palmer retired, the Cardinals were in the market for a quarterback. They are lucky here that Mayfield falls to them, but might have to be more aggressive come draft day in order to get their guy. This may seem high to some, but Tate is my number two ranked wide receiver in this class. The 6-foot-five wide receiver is a better route runner than given credit for and has enough speed to succeed in the NFL. It is impossible to not see some Alshon Jeffery traits when watching his tape. It will be interesting to see what he runs in the 40-yard dash at the combine. If he runs 4.5 seconds or better, he could overtake Ridley. James is one of the most athletic players in this draft. He started slow after recovering from surgery this season, but got better as the year went on. Even though I have him listed as a strong safety, he is much more than a typical in the box type. He can be a Kam Chancellor-like player in the secondary for ex-Seahawks defensive coordinator Gus Bradley. It’s time for the Seahawks to start thinking about life without Richard Sherman. Jackson can play opposite him this year and eventually take his place when he moves on. He has the height and ball skills Seattle likes in their corners. Currently he is No. 2, but he is not far behind Ward for the top cornerback in the class. Sutton gives the Cowboys a receiving threat opposite Dez Bryant that they have been missing for years. It will also give them insurance if and when Bryant is no longer there. Sutton has good size but needs to refine his route running. Like Tate, his 40-yard dash time will be highly scrutinized. The Lions have needed a running back for years. Ameer Abdullah is serviceable but Guice has much more potential. He immediately improves one of the worst rushing offenses in the league as well as takes some pressure off of Matt Stafford. He struggled through a left leg injury but got better as the year went on. He has the potential to be a three-down back in Detroit. Luckily the bears have Edmunds to slow him down. Davenport has been rising up draft boards due to his size and athleticism even getting some top-10 buzz recently. But a poor showing at the Senior Bowl should get him back into his rightful draft range of 18-25. His size is impressive, but he hasn’t shown much in terms of a pass rush plan. If his bull rush doesn’t work, he does not have a counter move at this point. He dominated small school players, but looked ordinary matched up with NFL talent at the senior bowl. He is all projection at this point but his potential is through the roof. The Bills started Jordan Mills at right tackle last season. Yes Bears fans, that Jordan Mills. It’s safe to say they will be looking for an upgrade. McGlinchey struggles with speed rushers at times, but is a mauler in the run game. He should thrive in the Bills run-first offense. If McGlinchey struggles at tackle, he has the traits to be an All-Pro guard. It is possible the Bills package these two picks to trade up for a quarterback. This is something that could interest the Bears. The Rams will most likely lose Trumaine Johnson in free agency. Oliver is a solid replacement at this point in the draft. He has good size for the position and already has solid technique. He should be able to step in and make an impact on day one. Julius Peppers is 38 years old and should be nearing the end of a Hall of Fame career. Key’s athleticism could make him the next Julius Peppers. But his rawness and injury history could also make him the next Barkevious Mingo. If all goes right for Key, the Panthers will get a steal at this point in the first-round. The Titans drafted Adoree Jackson in the first-round in the prior draft. But he struggled in his first season. Drafting Hughes will allow Jackson to be used as a slot corner and return man where he’s better suited. This pick would give them one of the most athletic groups of corners in the league. He has some off-field concerns but is easily a first-round talent on the field. The Falcons signed Dontari Poe to a one-year contract last offseason. He played well and it is possible another team will scoop him up. Vea provides everything Poe did with the possibility of more. The 6-foot-five, 340-pound nose tackle should free up space for undersized linebacker Deion Jones to make more plays behind him. Vander Esch is one of my favorite players because he reminds me of my actual favorite player: Brian Urlacher. The Saints defense was much improved last season but linebacker is still an area where they can upgrade. “Tackling Machine” is a cliche I hate because it is over-used, but it certainly applies to Vander Esch. He has a good feel for zone coverage and athletic enough for man coverage. The Steelers need some help on the backend going into next season. Mike Mitchell can be cut to save some money which will allow Harrison to step in right away. The Steelers were at their best with Troy Polamalu roaming the defense. Harrison can be a similar type of player. 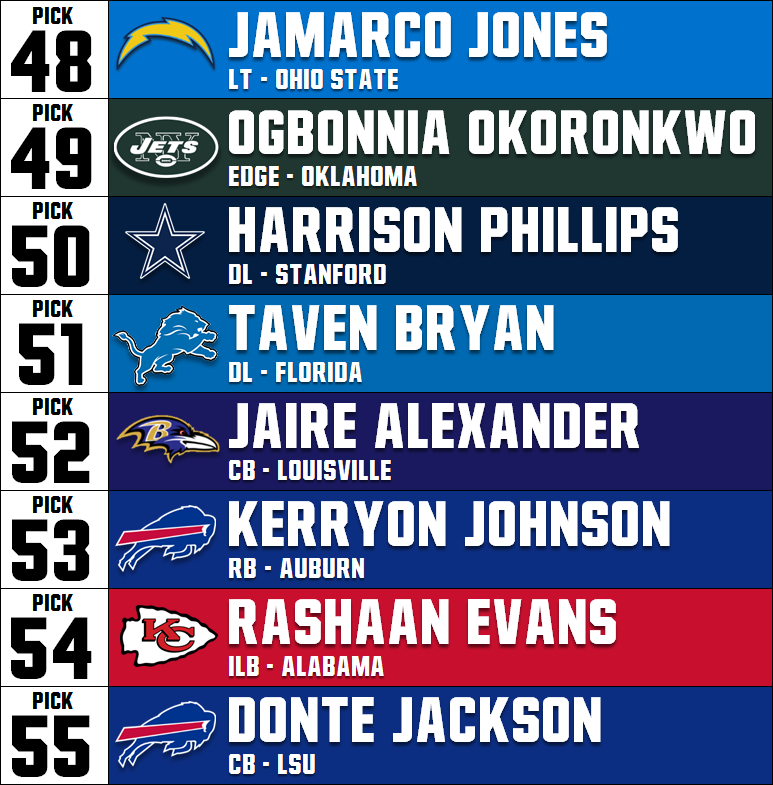 You can’t go wrong drafting Alabama safeties. Eddie Jackson can attest to this. The Jaguars grab a tight end here to help out Blake Bortles and the offense. While Andrews might not be the top tight end on my board, he fits their run-first offense better than others. He is a good blocker who can help in the run and pass game. The Jaguars need someone to take some eyes off of Fournette. There aren’t many first-round wide receivers left so they get the next best thing. Daniels instantly upgrades the Vikings in both the run and pass game. He excels at creating running lanes and has enough athleticism to get to the second level. With uncertainty at the quarterback position, the Vikings need to solidify the offensive line in order to run the ball more effectively. The Eagles are a team with not many holes on their team. But with Jason Peters likely retiring, they snag an offensive lineman to take his place. Last year’s fifth-round pick Halapoulivaati Vaitai played ok but Miller would still be an upgrade. Protecting Carson Wentz should be the Eagles top priority this off-season. The Patriots are another team with not a lot of needs. So they go best player available with this pick. Hurst is a terror along the defensive line and can be moved up and down their defensive front. Most mocks will have him higher than this, but he is undersized which will scare most teams away. He makes up for his lack of size with a quick get off and good hand use. In the second round, the Bears grab guard Will Hernandez from UTEP. The Bears missed out on the best player in the draft inQuenton Nelson in the first round, but they still are able to get an upgrade at the position in Hernandez. Hernandez dominated the Senior Bowl and could sneak into the first round with a good combine. As of right now, he is an early to mid second round prospect. Hernandez’s strength is his run blocking. He has great size at 6-foot-three, 330-pounds which allows him to be a force in this regard. The two-time second-team All-American plays with a mean streak you need to be a dominant offensive lineman. The Bears were last in the league in negative runs this past season. With his elite strength and run blocking footwork in the fold, they should instantly improve in that area. He still needs some work in pass protection which is why he drops to the second-round. He showed some flashes, but was too inconsistent at times with his hand use. With proper coaching, he should be able to at least be average in pass protection. Given his elite run blocking, this would make him a great guard. Harry Hiestand will be licking his chops to get ahold of this kid and coach him up. The Bears walk away from this draft with two starting caliber players at positions of need. Even though wide receiver and defensive back still need upgrades, I like the depth in this class so they should be able to fill those needs later on. 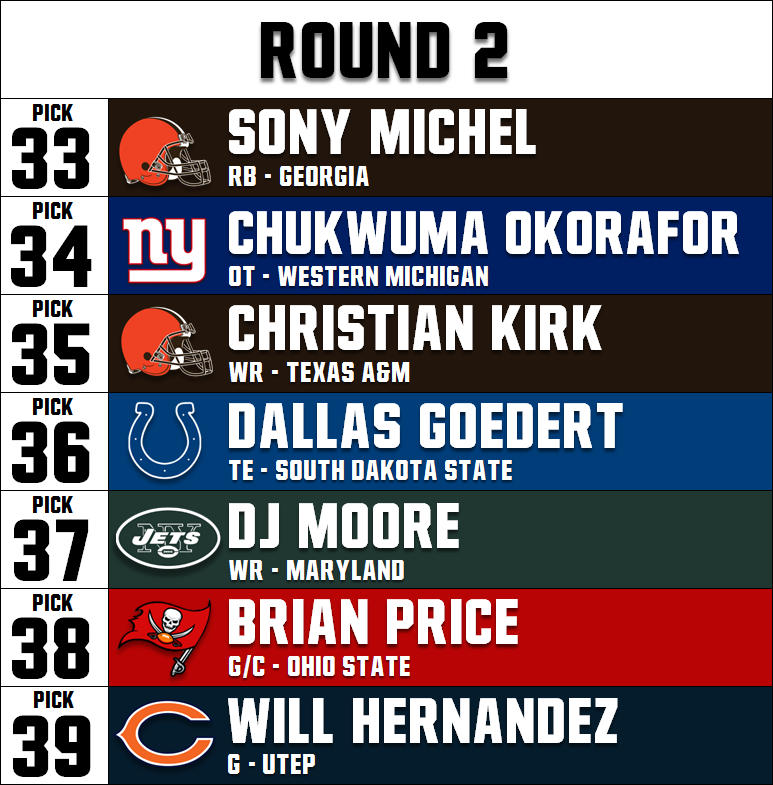 Would you be ok if this is how the draft fell? Do you think the Bears are better-suited drafting different players? Think you can do better? Comment and let us know your thoughts! Browns need to pick up Kirk Cousins and possibly trade their first pick and hope Mike White is around later. Thanks for reading, Roman! That’s not a bad strategy for the Browns at all. If they get Cousins, then they can use their first two picks on Barkley and the best defender available. That would be quite a turn around in one offseason. Good stuff. People always overlook the line positions because they are not flashy, but they are super critical. Thanks Elliot! Totally agree. Teams have to build their team from the inside out. Solidify the offensive line and it makes the QBs, RBs, TEs and WRs jobs easier. Do you think there’s a chance that Hiestand will move Kyle Long to right tackle? Thanks for reading! I don’t think that’s going to happen. Kyle is coming off of a couple surgeries so that would be asking a lot of him. Plus Massie played well after the first couple of games. If they look for an upgrade at tackle it will most likely come in the draft or free agency. As I don’t follow college football I really appreciate your insight. I guess will just have to see how close you are with your mock draft. Thanks for reading Robert! A lot will change between now and the draft so this will most likely be way off. But you can hopefully use it as a way to get familiar with each prospect in case the bears draft them. This scenario sounds good to me. It was apparent they needed more pressure on the quarterback last season. And to help solidify the offensive line would really help. Vikings – OT Mike McGlinchey, Notre Dame The Vikings have a lot of pending questions on offense, but they made it farther than most expected. The Vikings could use an upgrade up front and McGlinchey is a tough blue collar lineman who plays with a physical nature and good technique; however, some teams think he is a RT because of struggles against speed rushers.